Go on a daring adventure at The Hidden Castle, just an hour away from Hyderabad where you can live like the royalty and also indulge in activities like trekking, rock climbing, and aqua sports. 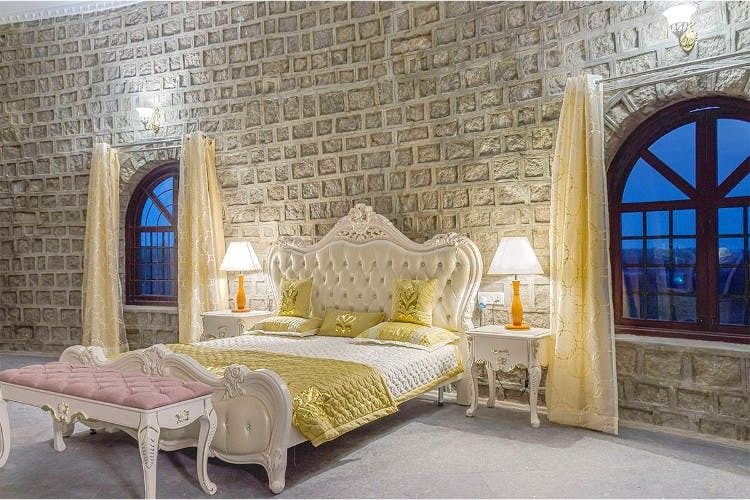 If medieval castles fascinate you, The Hidden Castle shall bestow you with an opportunity to stay in one. Think of royal castles in Disney movies with stone walls, plush interiors, a queen-sized bed, and this resort has it all in its royal suite. You can also choose to go for a heritage suite with vintage decor or opt for group living in a hall full of bunk beds too. Perfect for team building events, school, and college trips, or simply for a staycation where you want to live lavishly away from the hustle and bustle of city life. Plus, it is surrounded by a lot of natural beauty. For nights when you want to go camping under the moonlit sky, they provide private tents with comfy beds, bonfire and BBQ set-ups (at an additional cost). Not only that, but adventure seekers are in for a ball as activities like rock climbing, trekking, rappelling are going to win you over! You can either go here for a day trip with the squad or book the place for team outings. If you'd like to go with your puppy poo, you can do that too since it is pet-friendly. For INR 1,200 per head for a day trip and INR 3,000 for a camp stay, you will get your money's worth here. The website needs to be updated with the right prices for each of the stays.